Gandolfo Gabriele David’s work reveals the ontological necessity to establish an ethical and political dimension of hospitality between cultures and societies in contemporary artistic production. This ontological necessity has led his interests to reflect on hospitality as the modernist idea that encourages all human beings - regardless of their political affiliation - to be (or attempt to be) citizens in a single community, taking into consideration topics such as immigration, diaspora, and negotiation of identities, David increases the importance of the analysis on the problem of the immigration policies in his artistic practises. These premises could be particularly suitable for setting the parameters of a possible or impossible ‘ethics of hospitality’ in art theory. Modesta Di Paola: You are from Sicily, an island situated in the centre of Mediterranean, land of many ancient traditions and mixed cultures. Can you tell us about some of your projects particularly linked to your land? Gandolfo Gabriele David: The relationship with Sicily is an important dimension of my work. Through a survey of collective imagination and exploration of ritual and traditional figurative, I detected a trace of a universal and archetypal history. For Orior, installation/happening, I asked sixty invited ordinary citizens or representatives of organisations from Italian and Sicilian places, to bring a sample of their land and recount the stories and connections to their land. Each sample was different in grain, texture and colour, forming a portion of a very large ring. The circular shape is also a symbol that the alchemists attributed to gold (ore and spiritual). I investigated earth and the circular shape according to the multiple forms, in many projects. G. G. D. : Yes, in Axis Mundi I started from the suggestions of the ancient Sicilian rites (Christ’s procession of bands and the dance Ballo della Cordella) creating a sculpture carved out according to the body of a man, capable of connecting heaven and earth. A small architecture that manifests, with its symbolic references the man’s need to return to be part of a unit, a ‘sanctified’ cosmos in which all forms of existence are connected and interdependent. M. D. P.: Your work begins to open to issues related to the hospitality in works such as Osea 2. Would you like to tell as about this work? G. G. D.: Osea 2 refers to the Eastern tradition of mandalas and combines cosmograms and the oldest figurations, materiality and twentieth-century marks. 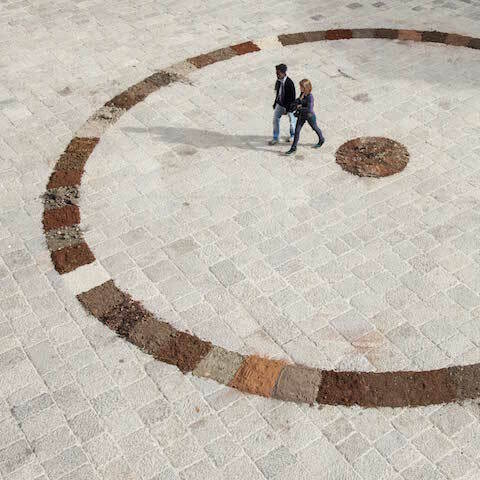 For OSEA 2 I invited members of the local community to fill a pattern that evokes the image of a fissured ground with grain, thus achieving a work on secular rituals of fertility and reconciliation, a rural vitality catalyst that powerfully recalls the joy of the sacred. For me, it is essential not to offer aesthetic metaphors but specifically ethical meanings. The contemporary earthly dimension lives a disconnection determined by socio-economic and cultural systems based on individualism. With Ricucire la terra, I invited eight embroiderers to translate on canvas the shapes of the installation Osea 2, trusting in the delicacy of a female symbolic gesture, the work of mending the fractures created by the violence that human beings have practised on earth. The embroiderers of Alcamo have embraced all these suggestions and accepted the invitation to create a work of a sacred nature directly linked to the altar panels that adorned the altars of the Sicilian churches. The relational aspect is a cornerstone of my research and a contemporary one, which attracts artists and ordinary people in a direct confrontation with specific issues such as ecology, geopolitics, power - all of which are intrinsically linked to the land. Basically, the artist cannot give precise answers, but metaphors and suggestions that can enrich or should reflect the community in which he lives. M. D. P.: Salemi is a little village in Sicily considered a site of hospitality for its compromise with immigrant communities. There you started an interesting project with some people of that community. G.G.D. : Bet_lehem/Bread House (Salemi) is the second stage of a touring exhibition, essentially characterized by a metal frame of a house in its most archetypal form, that is designed to include within it processes and formalization activated through workshops. The installation was realized during my residency at the communities’ houses managed by C.O.R.F SOCIAL COOPERATIVE Onlus. This association, runs the project SPRAR (Protection System for Asylum Seekers and Refugees) in some facilities of the City of Salemi and manages teenagers entrusted by the Juvenile Justice Center in other places of the same city. BET_LEHEM, translated from Aramaic as “BREAD HOUSE”, means ‘the place for hospitality and basic needs of nourishment and shelter’. The city of Salemi in west Sicily, is linked to the “traditional dinners or altars of St. Joseph”; here the bread has a special emphasis on the theme of the sacred and conviviality. I incorporate a small metal frame altar in the installation (that was previously used and made available by a local family). On this structure the participants to the workshop deliver not only the usual bread loaves but also shapes of bread created according to their suggestions and cultural worlds. These different backgrounds often have a story of pain in common, that BET_LEHEM symbolizes, wishing the participants a real renaissance in their new community. The installation is grafted in the heart of the local tradition, presenting itself as a fundamental moment of encounter between different cultures and generations, but above all, as a syncretic tribute by those who have physically realized it in the city of Salemi. The audio track that accompanies the installation is one of the songs sung by the boys from Bangladesh during the processing steps and it is the prayer for protection addressed to Allah. M. D. P.: Your investigation on the otherness and the immigration policies continues in Bet_Lehem or Re-birth that was presented in the Museum of Contemporary Art of Palermo, Riso. G. G. D.: Yes, Bet_Lehem or Re-birth is a community specific project realized in collaboration with Dimora OZ, Asante Onlus, Missione Speranza e Carità and some young people of the European Voluntary Service and the High School Liceo Classico G. Meli in Palermo. The installation was realized after several workshops in which immigrants and Palermitans met and shared the experience of making bread together. The tiles made of bread contain posts, signs, symbols and metaphors collected with a storytelling process. As "Bet Lehem" means "house of bread", consequently the installation manifests the archetype of the house, the home in which people find nourishment and shelter. The concept of rebirth is a warning by the artist to the community, to reflect on the sense of welcome, that is important for every country from a social, economic and civil point of view. M. D. P.: Many thousands of “others” have risked their lives this year, fleeing conflict and instability in Africa and the Middle East, in small, often decrepit vessels in an attempt to reach European territories. What is your last project implicated with this situation? G. G. D.: I have reflected about this huge phenomenon in WE ARE HERE / NOUS SOMMES ICI, a site-specific intervention on the Roi Renè tower, inside Fort Saint Jean, the defensive structure of ancient Marseille. The flags that have always been responsible for the representation of identity are here reconsidered. The material chosen resumes the high visibility technical fabrics we have learned to recognize in the chronicles of tragedies related to immigration. Probably from the age of construction of the Roi Renè tower, sensitivity has certainly changed, yet Europe (but also America after Trump) lives a strong conflict not only in identity but in geopolitical action and intervention, dissipated in hostility issues, Economic sustainability and the awakening of an increasingly ingenious and politicized xenophobia. The installation remodeled the experience of a common object (the flag, always a seal of national identity) bringing it into an aesthetic and ethical sublimation, addressing not only those who come from the sea, but specifically wanting to make the local community aware of the values of hospitality. I want to sent a strong message of peace, tolerance and welcome, ensuring that this installation can go to the heart of the city through my presence in many place of the city. I want to meet immigrant people of Marseille and invite them to discover the installation and give them a small orange flag functioning like a fragment of the work. I propose to make this fragment theirs, to use it as they wish and to personalize it with a symbol of welcome. At the end we can create a living installation in which we can say, all together: WE ARE HERE. M.D.P. : Your project will be presented in two important institution in June. G.G.D. : I will present the installation and workhshops We are Here / Nous Sommes Ici at the MUCEM, Marseille, opening 24 May 2017. And BET_LEHEM / La casa del pane inside the exhibition "A HOUSE, HALFWAY" at the Fondazione Sandretto Re Rebaudengo (Torino, 16 maggio, 8 ottobre 2017).